Two new double decker buses went on show at Brisbane’s Suncorp Stadium this week, illustrating Queensland bus builder Denning Manufacturing’s desire to see the two-storey vehicles integrated into urban bus routes. Bought by Thompson Bus Services to work the southern Queensland TransLink operator’s school route services, the double deckers are yet to be considered for urban city running. Denning Chairman Bob Roberts says his company sees the double deck coach as a contender to help solve traffic congestion affecting south-east Queensland. "This vehicle is the same width and length as a normal city route bus," he says. "In a transit configuration, the double deck takes a low floor off the road and frees it up for other uses, reducing congestion by taking that standard bus off the road." Roberts says Thompson’s new Denning has the same manoeuvrability as a standard route bus. "Roundabouts and normal size bus stops are not an issue," he says. Although not stating the price, Roberts says it costs less than an articulated bus or two equivalent low floors. Roberts says it’s been ten years since a coach-style double decker had been brought to the Australian market. "We thank the support of visionary operators – Thompson Bus Services, Kangaroo Bus Lines and the Driver Bus Lines – who have backed Denning into developing this particular model," he says. "I would also like to thank TransLink in their vital role for assisting to develop this product to the market." TransLink CEO Peter Strachan wouldn’t commit to funding double deck buses into urban city service until the new double decker was fully assessed on Thompson’s TransLink-subsidised school runs. "There’s no reason why we (TransLink) shouldn’t consider putting that on urban mass transit services but we just want to take this one step at a time – put it on school runs first then review it," Strachan says. "We are interested in evaluating all types of ‘superbuses’ and large capacity vehicles," he says. Strachan says height could be an issue, as it was in Sydney several years ago with urban double deckers. "But one of the good things about these buses is that they are the same width and same length as a standard urban bus," he says. While the Denning coach-style double deckers are now in service, Southport bus builder Bustech is about to release a double decker of its own on the Gold Coast, although still at prototype stage. Strachan is also keen to take a close look at the Bustech offering. "Again it’s a demonstration vehicle built by Bustech, but not quite at the same position as the Denning double deckers," Strachan says. The Bustech vehicle has been commissioned by Transit Australia Group’s Surfside Buses, with a preview coming up later this month. "It’s something we want to discuss with Surfside – whether it’s the right application – and we will evaluate the Bustech double decker in the same way we are evaluating the Denning vehicles," Strachan says. "Anything that gives us over 100 seats gives us deliverable capacity and it makes it more efficient to run the network." Denning’s General Manager Mike Dempsey is mindful of the height question, but dismisses it as a non-issue. "Although at a couple of extra metres in height (4.3 metres) compared to a normal city bus, you are looking at the same length as a 12.5 general access vehicle," Dempsey says. "And weight is not an issue as we still have about two tonne up our sleeve." The Denning double deckers come in at about 14.6 tonnes, and GVM is 22.5 tonnes. Dempsey says Denning is also working on a concept city-bus double decker, with plans to build one as soon as the money lands on the table. "We have a concept for an urban double deck with a walk through low floor over the rear axles, and in excess of 90 seated up to 110 including standees," he says. "Nothing has been built yet – we are just waiting for someone to order one and we will build it." Queensland Transport Minister Annastacia Palaszczuk was impressed with the double deckers at the official Suncorp Stadium launch. "When I was asked to launch the double deckers I thought we have a little bit of London here in Queensland," she says. "Having looked at these buses and having lived in London for a year I can say that the quality is much better than London." 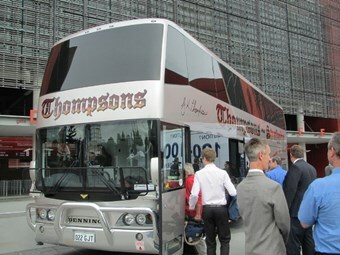 The Thompson double deckers are essentially replacement vehicles for 25 year old buses in the Strathpine based fleet, with two more on order and in build at Denning’s Archerfield factory in Brisbane. Palaszczuk says the Thompson double deckers are part of a Queensland-wide school contracted fleet covering 2000 school services carrying 120,000 school students each day. "The Queensland Government is committed to providing our school students with newer safer and better buses, replacing almost 900 older buses since 2002," she says. "An initiative such as these new double deck buses is important in delivering a strong public transport network for our region." Palaszczuk says through the School Transport Assistance Scheme the Queensland Government will continue to fund school services to $170 million a year. The launch was attended by some well-known Queensland bus identities who service part of the 2000 school services mentioned by Palaszczuk. Townsville operator Wayne Campbell, Bundaberg operator Richard Hayes, and Logan City’s Reg and Yvonne Clark with their CEO Graham Davis were present at the launch attended by about 200 industry representatives.